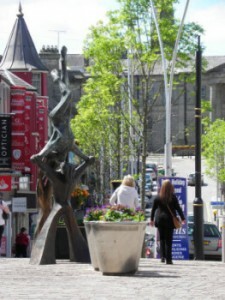 Omagh is the County town of Tyrone and is located on the main A5 road from Londonderry to Dungannon. Recent upgrades to the roads network means that it is now one hour from both Lisburn and Londonderry as well as being within easy access to Fermanagh and Donegal. The River Strule, a tributary of the Foyle winds through the town and in conjunction with church spires and stone bridges gives a picturesque appearance to the town centre. The town has a population of approx 28000 and is home to churches of all denominations. There are two Presbyterian congregations within the town boundaries and a further 7 within a six mile radius. The town is an administrative centre for many Government departments as well as serving as the headquarters of the Western Education and Library Board. There are four primary and six secondary level schools within the town borders as well as a new large sub-regional further education college. The main industries would be agricultural and engineering and there is a large service sector. The public services of health and education would represent the major employer in the district. Agriculture and meat processing have been the traditional employers for many years but over the past twenty years light engineering has become predominant and has attracted a sizeable population of Eastern European residents. Sport and leisure facilities are extensive and extremely well utilised by all age groups within the community. There is also a vibrant Arts Centre which has been recently built on the site of the old Town Hall.